A man has appeared in court after a police officer was injured in a suspected hit-and-run. 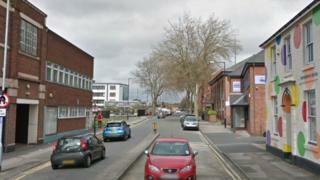 The West Midlands Police officer was struck by a car in Hatherton Street, Walsall, on Thursday. Clover Johnson, 51, of Hilary Road, Pleck, appeared at Walsall Magistrates' Court earlier charged with four offences, including causing serious injury by dangerous driving. He was remanded in custody to appear at Wolverhampton Crown Court on 9 October. Mr Johnson has also been charged with grievous bodily harm, assault and actual bodily harm. Police said the 50-year-old female officer had suffered a serious head injury, broken ribs and a punctured lung.